750077 Homing Spider Droid is a Star Wars microfighter set released in 2015. This is a description taken from LEGO.com. Please do not modify it. (visit this item's product page) Attack the Republic forces on Geonosis with the Homing Spider Droid™ microfighter! Go on the hunt on planet Geonosis with the heavily armored LEGO® Star Wars™ Homing Spider Droid™ microfighter. This amazing small-scale version of the Droid featured in the Star Wars movies has cool detailing, adjustable legs, flick missile and even a mini cockpit for the Battle Droid to sit in. Give the order to take down the Republican forces! 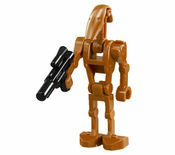 Includes a Battle Droid figure with a blaster. Move into position and fire the flick missile! Amazing miniature version of the Homing Spider Droid featured in the Star Wars movies! Facts about "75077 Homing Spider Droid"